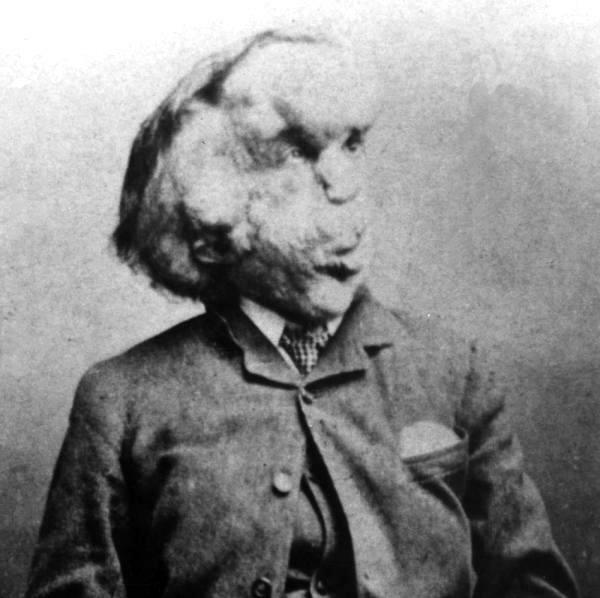 Joseph Merrick was born in 1862. A younger brother, William, was born in January 1866; a sister, Marion Eliza, followed in September 1867. She too was crippled at birth. At the time, it was thought that this was a coincidence (Marian Eliza was to die at age 24 of myelitic convulsions). Still, things were going well. And then came the hammer-blows: Joseph began exhibiting symptoms of his disease at age 5; William's death from scarlet fever in 1870, aged four; and his mother's death from pneumonia on her thirty-sixth birthday in May 1873. 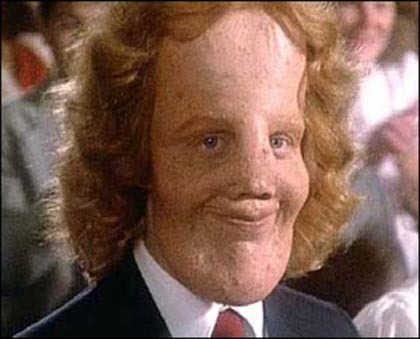 Rejected by his father and his new step-mother, Joseph Merrick was doomed to a workhouse where others incorrectly thought him to be mentally retarded. From there he was taken by Tom Norman and exhibited at a freak show. Surgeon Frederick Treves rescued Merrick from the freak show and took him to the London Hospital. Treves misunderstood his name at first: he caught it as John. 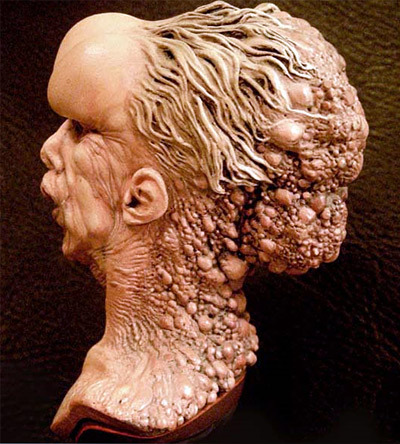 He called him John; he wrote, eventually, of him as "John Merrick." Joseph took this as a nick-name. 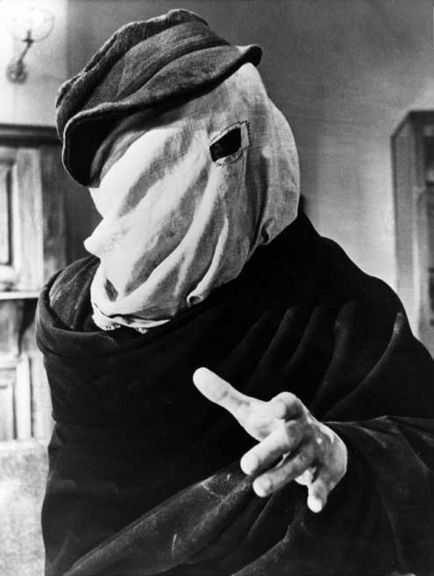 On Friday, April 11, 1890, Joseph Carey Merrick died at 1:30 p.m. from asphyxiation at the London Hospital, caused by the rigid thickening and the distortions of his body pressing down upon the lungs. 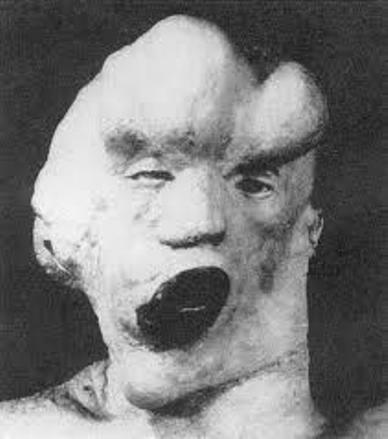 Originally it was thought that Joseph Merrick suffered from neurofibromatosis type I. Symptoms of this genetic disorder include tumors of the nervous tissue and bones, and small warty growths on the skin. One characteristic of neurofibromatosis is the presence of light brown pigmentation on the skin called café au lait spots. 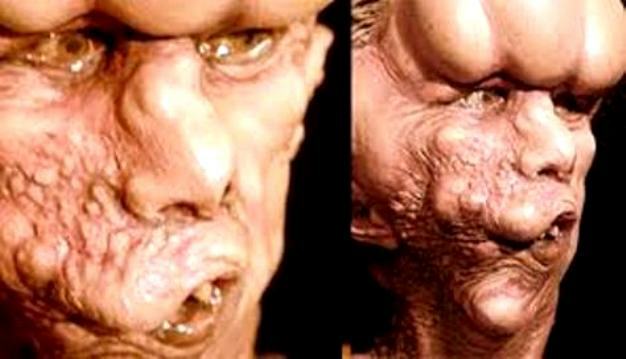 These were never observed on Merrick's body. 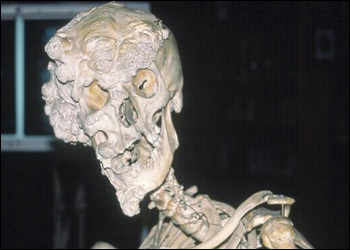 Neurofibromatosis type I was the accepted diagnosis through most of the 20th century, although other suggestions included Maffucci syndrome and polyostotic fibrous dysplasia (Albright's disease). In a 1986 article in the British Medical Journal, Michael Cohen and J. 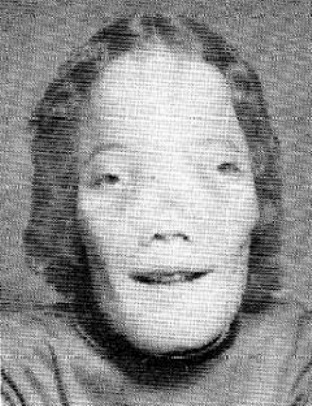 A. R. Tibbles put forward the theory that Merrick had suffered from Proteus syndrome, a congenital disorder identified by Cohen in 1979. They cited Merrick's lack of reported café au lait spots and the absence of any histological proof that he had suffered from neurofibromatosis type I. 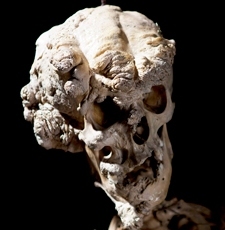 Unlike neurofibromatosis, Proteus syndrome affects tissue other than nerves, and it is a sporadic disorder rather than a genetically transmitted disease. Cohen and Tibbles said that Merrick showed the following signs of Proteus syndrome: "macrocephaly; hyperostosis of the skull; hypertrophy of long bones; and thickened skin and subcutaneous tissues, particularly of the hands and feet, including plantar hyperplasia, lipomas, and other unspecified subcutaneous masses." 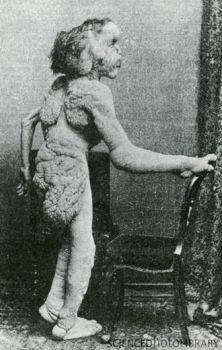 In a letter to Biologist in June 2001, British teacher Paul Spiring speculated that Merrick might have suffered from a combination of both neurofibromatosis type I and Proteus syndrome. This hypothesis was reported by Robert Matthews, a correspondent for The Sunday Telegraph. 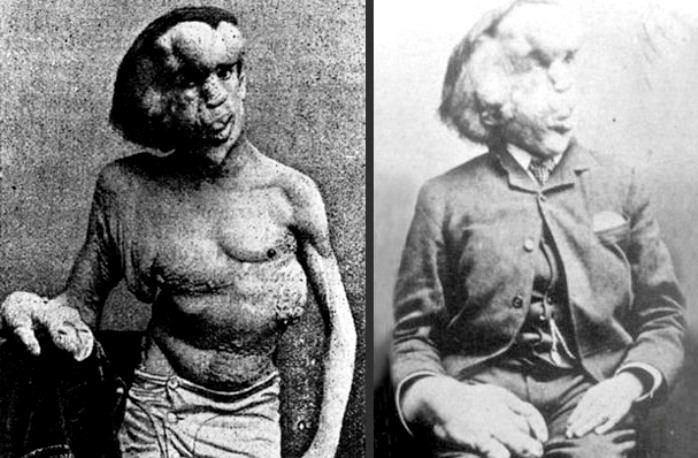 The possibility that Merrick had both conditions formed the basis for a 2003 documentary film entitled The Curse of The Elephant Man that was produced for the Discovery Health Channel by Natural History New Zealand.